The steps are all there. 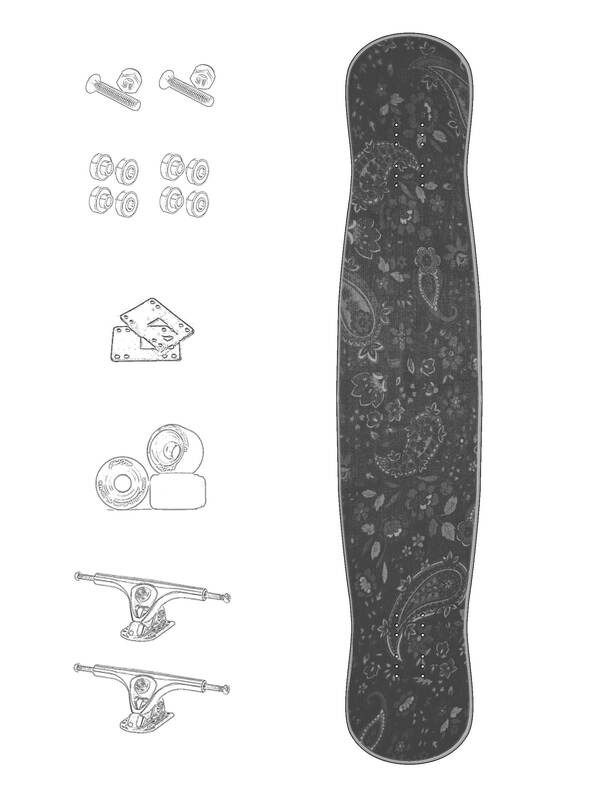 For a complete deck you need wheels, trucks, nuts and bolts, some griptape, bearings and shockpads. You may also want a skatetool, so you can tweak your board to your personal preference. But everything is optional. If you already have some cool wheels, just leave the wheels unselected. You can clear your choice by clicking ‘clear selection’. You can click on the product you want and click on ‘update complete’ to select it and add it to your configuration. Because we install Fancy Dancer Grip during the production process, you will first have to select a board. The option to choose your Fancy Dancer Grip will appear after your board is chosen. Boards, Trucks, Wheels, Bearings, Nuts & Bolts, Shockpads, Griptape, Fancy Dancer Grip, Tools. When choosing your board there are a lot of factors to consider. In the end it always comes down to personal preference. Use this spectrum to see whether the model you want is more freestyle or dance oriënted. You can dance on an axolotl if you want, but because of its length it is considerably better suited for freestyle than for dancing. All our boards are made to do it all, but the flamingo for example is better for dancing. You can check all the boards we have here. Click on them to see more detailed information about all the specifications like length, width, style etc. There are some things to know when choosing your trucks. It is mostly about the ‘feel’of the truck. We suggest the Paris trucks for fluid dancing. We suggest the Caliber trucks for the more freestyle side of things. But always: it is personal preference. If you are planning on skating hard and dropping in from heights, we suggest the precision forged trucks. We now have the Paris Savants. They are more expensive, but will last a lot longer. Larger wheels will roll more easily and longer than smaller wheels. We consider large wheels to be larger than 66mm. Don’t forget shockpads with these size wheels. Smaller wheels are 66mm or smaller. Also, the contact patch (the part that touches the concrete) is important. Smaller means easier sliding where bigger contact patches gioves you more grip while dancing. Next to these sizes there is also the shape of the lip. Is the wheel rounded? That means that your slides will start more easily. If the lip is sharp you will get way more grip in tight corners. You got the choice between ‘normal’ built-in Zealous bearings, or the ceramic Zealous bearings. Ceramics are known to be more durable and a bit more self-cleaning, but with proper care you can get the most out of any bearing. To make the bearrings roll even better we suggest to use some lube now and again to clean it and lubricate the bearing. Choose between panhead or flathead. You can feel the panheads, whereas th flatheads are flush with your board. For larger wheels (larger than 66mm) we suggest a 1/4” riser. For anything smaller we suggest the 1/8” riser. You can also go for no risers. Our boards have wheelwells to counter possible wheelbite, but to be safe on really loose trucks, get some risers. You have several options. The fancy dancer grip can be selected after you choose a deck. It has to be installed during production so it will take a bit longer to complete your deck. If you don’t want the fancy dancer grip, you can go for either full grip or nose and tail grip. Also here you have different options: clear or regular griptape. There is also the option to combine both the fancy dancer grip with nose and tail grip for optimal freestyle/dancing. There are a lot of options here. Every single one has a different feel. We scale the grips compared to regular grip. Some are a lot less grippy, some are very grippy. Browse through the selection to get an idea of what we’ve got for you. The simple T-tool will suffice. If you want something more fancy, the Y-tool is also functional as a rethreader. This will come in handy if you need to remove a bolt of your trucks by force. We also carry the Silver tool with a built-in rattle so you don’t have to reposition your tool everytime you twist it. There are more, but they all do the same thing: giving you the power to tweak your board to your personal preference.